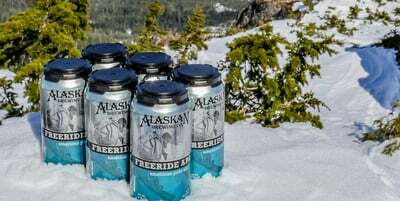 Alaskan Brewing Co. announced the start of a facility expansion, the installation of a new beer canning line and the beginning of distribution into South Dakota and Michigan. Once the first phase building construction is finished, the plan is to move the canning line into the new building. The facility expansion broke ground last week and will allow for Alaskan to join its two existing buildings together, in order to make more room for packaging and warehousing. Larson said it will also bring greater efficiency to operations, as forklifts will be used to move supplies and product instead of the current system of trucking beer between the two buildings. The expansion will be conducted in two phases, with the first phase allowing for increased warehouse and production capacity completed by February 2015. The concept for the second phase will eventually allow for new retail space to expand the brewery’s gift shop and tasting room. The new canning line installed in the past month was chosen with quality in mind, and reduces the amount of oxygen picked up during the canning process to the same level as the bottling line, which will continue to ensure the freshest tasting beer for Alaskan fans. In order to enter the growing beer can market, Alaskan bought a small filler and shoehorned it into a tight spot in the brewery between the existing bottling line and the packaging tanks. Holmes said that once the first phase building construction is finished, the plan is to move the canning line into the new building. “With the larger warehouse we can then increase our production and supply cans to the rest of our markets,” Holmes said. And those markets have expanded as well – with the addition this week of South Dakota and Michigan, making a total of 17 states where Alaskan is now available. Alaskan Amber and Freeride APA will kick off the new canning line. In South Dakota, Alaskan beer will be distributed through four distributor partners – Beal Distributing in Sioux Falls, Ellwein Distributing in Huron, Conkling Distributing in Yankton, and Eagle Sales in Rapid City and Chamberlain.